You are here: Home » Blog » Budget 2014: Has The Government Abandoned Green Business? Has Budget 2014 seen the government continue the abandonment of its green credentials and bow to the simplistic message pushed by polluting industries? Probably the key budget announcement affecting green business was a freezing of the carbon price floor. The carbon price floor is a sort of top up tax that was introduced in 2012. Its aim is to put a meaningful price on the cost of carbon. A meaningful price on the cost of carbon reflects the long term social and economic costs of continuing to damage the planet. It also changes the economic case for clean energy vs dirty energy and plays a role in driving investment in clean energy technologies. At an EU level, there is the EU Emissions Trading Scheme but the price of carbon under the scheme has fallen to levels that don’t come close to reflecting the genuine costs of continuing to produce dirty electricity and are not sufficient to drive changes in energy consumption or generation. The point of the carbon price floor was that it would rise over time and eventually reach £70 per tonne by 2030. 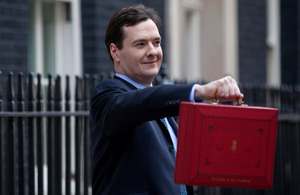 Yesterday, George Osborne announced that it will be frozen at 2014 levels (just under £20 per tonne). This move is being welcomed by many in industry and must be a welcome break from rising energy costs. The carbon price floor has always had its critics and importantly it was a unilateral measure by the UK. It made energy production (and therefore consumption) more expensive here than in other countries and has often been seen as damaging to competitiveness. So industry will be championing this budget? Well, heavy polluters will be. Many businesses will be pleased with a decision that should have some positive effect on rising energy costs. Those in energy intensive industries will no doubt be happy that they will be exempt from the cost of the Renewables Obligation and the Feed in Tariff. Those investing in clean technologies and those who see the benefits of leading the way to a green economy will be less happy. As usual though, what we are seeing here is short term thinking. There is definitely a case for questioning the carbon price floor. It doesn’t seem to have been overly effective for one thing and the UK going it alone puts businesses operating here at a disadvantage verses competitors. It might be better dealt with at an EU level through improvements to the EU ETS. But is the government really interested in that? and even if it was, the track record of meaningful action at intergovernmental levels is appalling. The short term element is this: The message sent by the budget and the recent “green levies” nonsense is that the government wants to make households and businesses happy with a policy of “we’ll make it cheaper for you to continue to waste resources and damage our long term future”. Wouldn’t we all be better off in the long run if those energy intensive industries that are hardest hit by rising input costs were to move to cheaper, cleaner and renewable sources? So… Has the government abandoned its green credentials in the budget? Probably not. I think most would say they did that a while back. Personally, I can’t say that I much care. I do care that we are ignoring the long term costs of climate change. It’s ironic that the budget includes £140 million of new funding for flood defenses but the government refuses to consider the costs of continuing to fuel climate change. I care that we can see the short term costs of rising energy prices but are ignoring the long term benefits of investing in better, cheaper, cleaner energy for the future. That is just stupid. Mostly my concern with the budget is the government continues to sow uncertainty that creates a negative environment for investment in necessary technology and innovation that could drive the UK forward. Lord Stern has warned that this fiddling is increasing uncertainty and reducing investor confidence. We’ve recently seen the UK drop in the Renewable Energy Country Attractiveness Index (RECAI) for precisely this reason. Its not really about this policy or that one. We need an energy strategy from this government and future governments that creates a stable environment to allow continued investment in renewables. The UK is in need of serious infrastructure investment. Those kinds of investments are much harder to make when energy policy is a political football and the debate is typified by vote grabbing and cheap point scoring. This entry was posted in Clean Energy, Climate Change, Green Business. Bookmark the permalink.